Thanksgiving is the best, my friends. Unless you’ve volunteered to feed a ravenous horde or the thought of family time makes you retch, it’s the easiest, most relaxed holiday there is. You just eat. And watch football. And eat some more. Then you have dessert. No pressure to find the perfect gifts; few, if any, decorations; no tired songs to hear over and over. I’m thankful for Thanksgiving. So what are you thankful for this year? Is it your family, your friends, your job, your smartphone? If you’re having trouble coming up with something, here are some suggestions. Unlike the old phone system that uses a switched network, VoIP uses the Internet to connect callers. Transmitting voice over the Internet has become a common occurrence with hundreds of millions of VoIP users worldwide. And thanks to apps like Voxox, anyone with an iPhone or Android can take advantage of all the great features a VoIP app offers. When you sign up for free with Voxox you get a new, free phone number that you can use for all of your calling. Your current phone number is unaffected, and since you have two numbers now, you can decide who gets which number. That’s pretty cool but here’s the best part: Any time you make or receive a call on your Voxox number from another Voxox number, the call is completely free. Invite your family to Voxox (it’s quick and easy right from your Voxox contact list) and make those awkward, once-a-year family phone calls for free. Talk as long as you want, as often as you want, with no fees whatsoever. Free calling is real. Free calling is great but for many of us, texting is the only way to fly. And using Voxox, all of your in-network texting is free too. Send SMS, photos, videos, and share your location for free all within the same app. Thank you, really low rates. Who has some of the lowest calling rates in the business? Voxox has some of the lowest international calling rates in the business! With out-of-network calls to many countries costing fractions of a penny per minute, you can talk for a long time without worrying about heavy phone charges. Take a look at Voxox’s super low calling rates and you’ll see for yourself. While VoIP, free calling, free texting and low rates are great things to be thankful for — especially in this holiday time of parting with lots of cash — the good people at Voxox want you to know that they are especially thankful for you. 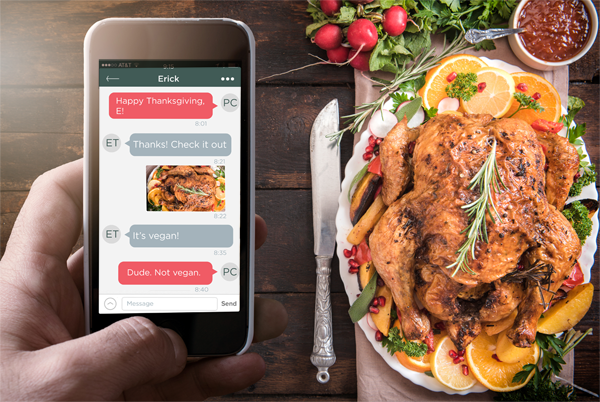 They’re thankful for your continued and enthusiastic use of the Voxox app, thankful for your kind product reviews, and thankful for the opportunity to bring you and your family together at this time of year — whether you like it or not. Happy holidays!